First step to being an effective woman leader: Don't try to be something you're not. (L to R) Renee Wilson, Maureen Lippe, Dale Bornstein, Gail Heimann, Barby Siegel, and Barri Rafferty at the Hall of Femme event in New York. NEW YORK: Women executives in the PR industry urged others not to emulate men, but rather be an authentic female leader to advance up the ladder. 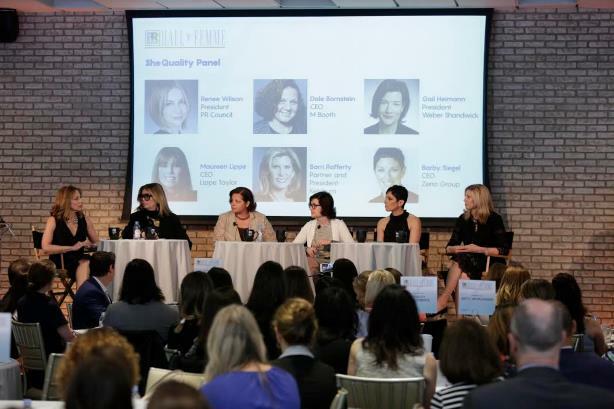 Six female executives, members of the PR Council's SheQuality Project, talked pay equity, career advancement, and leadership strategies at the 2017 Hall of Femme event in New York on Thursday. "Think about your authentic self," said Dale Bornstein, CEO of M Booth. "Women who lead from an authentic place and don't try to lead like men, but lead with the attributes and power of a great leader, go far." Maureen Lippe, founder and CEO of Lippe Taylor, echoed that sentiment. "The risk is to not act like an authentic female leader," Lippe said. "You have to be who you are. To not be authentic to yourself and to mirror how men lead is a big mistake." As the definition of a good leader changes, several traits traditionally associated with women are becoming more important, said Barri Rafferty, president of Ketchum. "A lot of the traits that are more successful for leaders are traditional female traits," Rafferty explained, with some caveats. "Though we’re still not seen as being calm or decisive in a crisis or seen as someone who's strong enough to run a company. It’s all about building up different muscles." During the panel, moderated by PR Council president Renee Wilson, executives also talked pay equity and encouraged agencies and companies to be more transparent about how they compensate their employees. Women make about 77 cents for every dollar a man earns, according to the National Partnership for Women and Families. Many firms have programs in place to address the gender-pay gap, so the next step is to look at "opportunity parity," in which women are not offered certain roles or assignments because they have families or don’t go out and ask for them, said Weber Shandwick president Gail Heimann. "We’re fixing the income parity, but are we fixing the opportunity parity?" she asked. "Are we ensuring we’re offering equal opportunity across the board as well?" Heimann also urged PR pros to challenge stereotypes about women in their client work wherever they can. "We have a massive opportunity to create change in the work we do," Heimann said. "We all have clients that exist in traditional space, it's up to us to challenge them to put together work to challenge stereotypes, to change it from the woman smiling by the pile of laundry."